The Butterfly pattern is a reversal pattern composed of four legs, similar to the Gartley and Bat pattern, marked X-A, A-B, B-C and C-D. It helps you identify when a current price move is likely approaching its end. This means you can enter the market as the price reverses direction. There is a bullish version where you place a buy trade and a bearish version where you would place a sell trade. The Butterfly is a reversal pattern that allows you to enter the market at extreme highs and lows. As shown above, the Butterfly pattern looks very similar to the Gartley or Bat patterns, with four distinct legs labelled X-A, A-B, B-C and C-D. 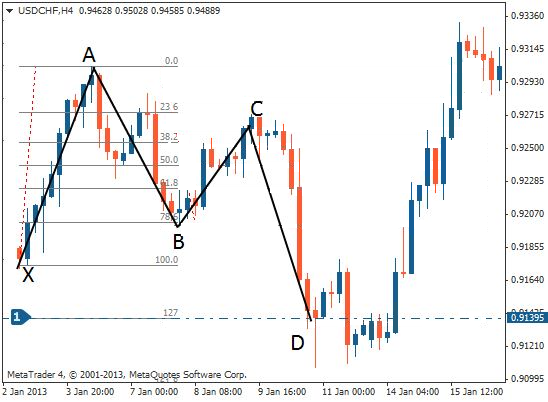 The above example is a bearish version of the pattern, where you would be look to sell after the pattern has completed. In its bearish version, the first leg forms when the price falls sharply from point X to point A. The A-B leg then sees the price change direction and retrace 78.6% of the distance covered by the X-A leg. The Butterfly is similar to the Gartley and Bat patterns but the final C-D leg makes a 127% extension of the initial X-A leg, rather than a retracement of it. In the B-C leg, the price changes direction again and moves back down, retracing 38.2% to 88.6% of the distance covered by the A-B leg. The C-D leg is the final and most important part of the pattern. As with the Gartley and Bat pattern you should also have an AB=CD structure to complete the pattern, however the C-D leg very often extends forming a 127% or 161.8% extension of the A-B leg. As a trader you would be looking to enter at point D of the pattern. 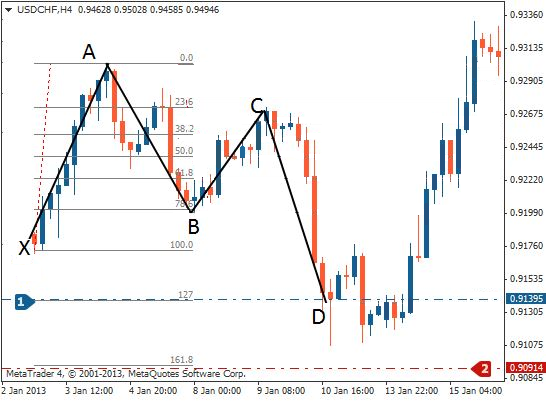 A major difference with the Butterfly pattern over the Gartley or Bat pattern is you look to place your trade entry order at the point where the C-D leg has achieved a 127% Fibonacci extension of the X-A leg. It is the pattern's longest leg. Ideally, point D should also represent a 161.8%-261.8% extension of the B-C leg. 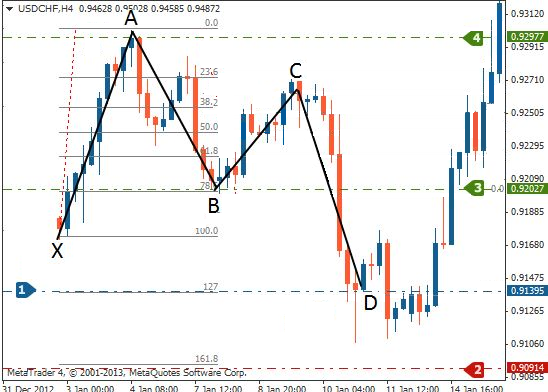 We will now look at how to trade the Butterfly pattern, first using a bullish pattern as our example. Identify where the pattern will complete at point D – this will be at the 127% extension of the X-A leg. To trade a bearish Butterfly pattern, place your sell order at point D (the 127% Fibonacci extension of the X-A leg), position your stop loss just above the 161.8% extension of the X-A leg and place your profit target at either point A (aggressive) or point B (conservative). ... the Butterfly is a reversal pattern that allows you to enter the market at extreme highs or lows. ... it is similar to the Gartley and Bat patterns but the final C-D leg makes a 127% extension of the initial X-A leg, rather than a retracement of it. 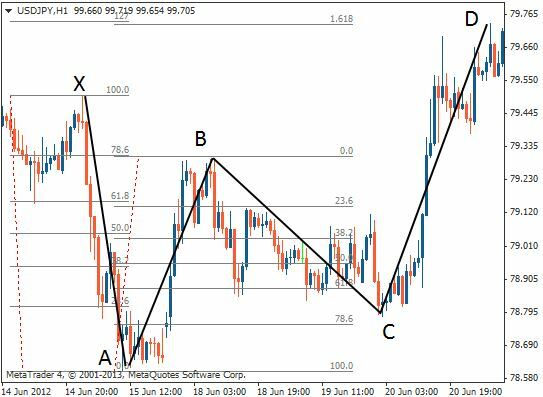 ... to trade the Butterfly, enter the market with a long or short trade at point D of the pattern – the price should reverse direction here. ... place your stop loss just below (bullish trade) or above (bearish trade) the 161.8% Fibonacci extension of the X-A leg.